Soybeans expert and D.F. Seeds founder John Diehl received the 2018 Leaders and Legends award from the Michigan Agri-Business Association for a lifetime of achievements that have helped boost the state’s agricultural industry. (From left) Michigan Agri-Business Association President Jim Byrum, award winner John Diehl and association Vice President Tim Boring at the award ceremony. Soybeans expert and D.F. 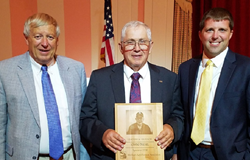 Seeds founder John Diehl received the 2018 Leaders and Legends award from the Michigan Agri-Business Association in Lansing recently for a lifetime of achievements that have helped boost the state’s agricultural industry. Diehl, 71, was presented with the award on Saturday at the association’s 2018 outlook conference held on Mackinac Island. The Leaders and Legends Award has been given out annually since 2013 by the association to honor individuals who have exhibited innovation, creativity and entrepreneurial skills in Michigan agriculture. Diehl grew up on a farm in Dansville originally owned by his great grandfather, and he pursued a career as an engine designer with International Harvester after graduating from Purdue University with a bachelor’s degree in ag engineering. After a tour of duty during the Vietnam War in the U.S. Navy as an anti-submarine operator on a P-3 patrol plane, he returned to the family farm and began to expand its certified seed production business known as Diehl Fields. During the next 20 years, Diehl earned a reputation in agricultural circles as an expert in developing specialized varieties of soybeans that successfully competed against seed produced by larger regional and international companies. He formalized the competition with its “Best of the Best” program at Diehl Fields. The company became known for producing a quality product through the use of innovations that Diehl himself invented, such as custom bean ladders with rubber coatings to reduce seed damage and a gravity table to improve seed physiology. In 1979, the operation released the first bean in Michigan with Brown Stem Rot resistance. Diehl changed the operation’s name to D.F. Seeds in 1992 to concentrate further on certified seed production, sometimes partnering with larger companies such as Asgrow, Dairyland, Callahan, Channel Bio, Crop Production Services, The Anderson’s and Remington. At the same time, D.F. Seeds continued to produce its own GMO and non-GMO varieties of seeds. In 1997, Diehl was able to launch D.F. Seeds as a stand-alone company with financial backing from former classmates at Purdue. In 2015, Diehl assumed the responsibilities as research director at D.F. Seeds after completing a transition that transferred ownership and overall management to Chris Varner, who became president of the operation. In 2017, Tillerman Seeds LLC, a Grand Rapids-based company created to acquire regional producers of specialty seeds, purchased the assets of D.F. Seeds and now is combining back-office functions with another acquisition, Legacy Seeds in Scandinavia, Wis. Diehl remains with D.F. Seeds as research director. In addition to the association’s award, Diehl received the Purdue University Agricultural Alumni Association's Certificate of Distinction in 2014, its highest award for alumni of the College of Agriculture. For more information on the association’s Leaders and Legends award and Diehl, please refer to the association link at Leaders and Legends. For more information on D.F. Seeds, please refer to this link at D.F. Seeds. For more information on Tillerman, please refer to this link at Tillerman & Co.